Skunks are not the only thing sticking around here lately. On Tuesday, the Missouri House Agriculture Policy Committee unanimously approved a bill - HCS HB 131 - which would repeal all of the major provisions of MO Prop B, the Puppy Mill Cruelty Prevention Act. You know what they said while they did it? They said "We respect the will of the people." Remember, MO Prop B was passed by a majority of Missouri voters in November. How is it respectful to gut the law? Veterinary exam for breeding dogs. Currently a vet can visit and approve the animals' health withut examining a single dog. Humane euthanasia by a veterinarian. Currently breeders often shoot their old, infirm, and non-productive breeding stock. Ample space. Current law permits lifetime confinement in a cage only six inches longer than the dog itself. Continuous access to water. Frozen water satisfies current requirements. Prohibition of wire flooring and stacking of cages. The Chair of the House Agriculture Committee had the nerve to say: "We just made it better." Better for whom? 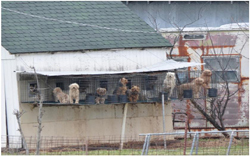 Certainly not the over 200,000 dogs living in Missouri puppy mills. Certainly not for the uninformed individual purchasing a puppy that originated in one of them. If you live in Missouri, contact your legislator and tell them the truth about HCS HB 131. Speak up about the necessity of protecting the welfare of dogs.